← Did the Court of Appeals Unwittingly Increase the Risk of Surety Companies Issuing Payment Bonds in North Carolina? A couple of my blog posts have mentioned the use of public-private partnerships (“PPPs”) as an alternative source of highway construction financing, including my February 6, 2012 story about NCDOT’s plans to widen I-95 (by the way, last Friday, the Federal Highway Administration gave tentative approval to tolling on I-95). It remains unclear whether any private money might be utilized to finance the I-95 widening project. What is clear is that PPPs present a host of legal issues that all project participants (and their attorneys) would need to wrestle with should the NCDOT seek private money for I-95, or any other state highway project. For additional depth, consult the National Cooperative Highway Research Program’s Major Legal Issues for Highway Public-Private Partnerships. 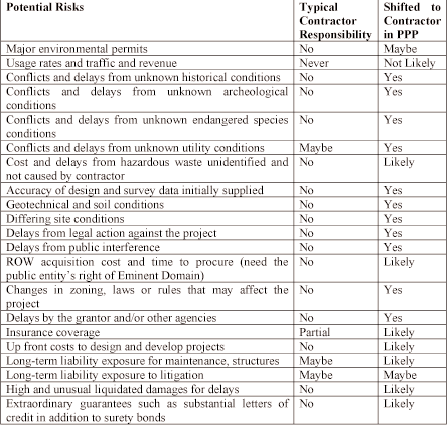 It presents several representative case studies and concludes that several successful projects have given PPP participants the flexibility to select the optimal project delivery system for their particular project. Such flexibility, of course, could mean procurement outside the sealed bid process. I’ll be keeping an eye on subsequent I-95 developments. Should the NCDOT begin exploring PPPs, it is hoped that these three resources will provide the contracting community with a foundation for understanding the legal ramifications of this alternative highway financing framework.